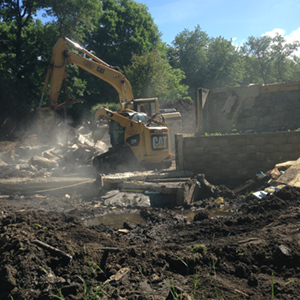 Havel Excavating is an experienced excavating contractor serving the Twin-Cities Metro Area. For more than 45 years, Havel Excavating, Inc. has continued to grow. We have performed some of the most hazardous construction activities and we have mastered the skills and capability necessary in commercial and residential excavating so we can provide our clients with value and results. Denny Havel, is the current owner-operator that started working for his dad who founded D. G. Havel Excavating, Inc. in 1971 when Denny was a young boy. Denny loved learning how to operate big machinery. He knew as a young teenager that this was going to be his career path. Havel Excavating is a family owned and operated excavating business because in 2008 Denny purchased the business from his father and then renamed it Havel Excavating, Inc.
Havel Excavating has built its business on successfully meeting the challenges of tough site preparation and commercial and residential excavating projects. Havel Excavating has the experience and equipment to meet your demanding site development requirements. Havel Excavating has the ability with which to combine the right equipment with our experienced crews this ensures that your site is ready on time. Denny is a firm believer in saying what you do and doing what you say, and he has over 35 years of experience in the construction business to prove it. Havel Excavating provides excellent service to its customers from the start of the job to completion of the job, and Denny always oversees all projects to ensure the highest quality of service. 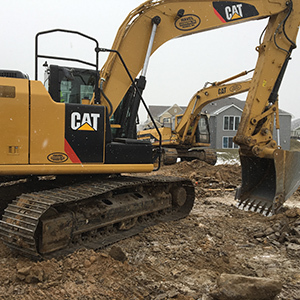 Excavating Services - Services include, but not limited to, basement excavation, building pads, back fill, road and driveway building, site work excavating and grading. Demolition Services - Services include, but not limited to, concrete tear out, driveway tear out, foundation tear out, house demolition, building demolitions, tear downs, debris removal and regrading. 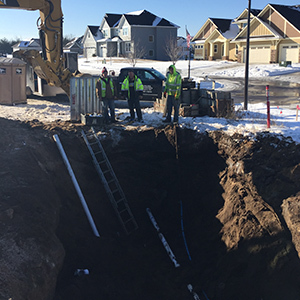 Sewer and Water Connection Services - Services include, but not limited to, new city sewer or water lines, repairing sewer or water lines and the connection and disconnection of sewer or water lines.